Reduces sand, soil, silt, rust and sediment based on 3M Testing. Try Great Taste Filtration to reduce Chlorine Taste and Odor. 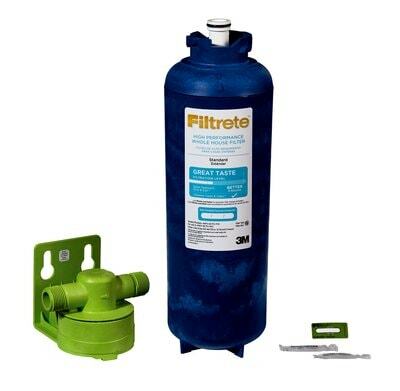 Filtrete™ Quick-Change Whole House Systems, Large Capacity filters incoming household water for all uses including drinking, dishwasher, clothes washer, and showering and is easy to maintain with a 1/4 turn 12-month replacement filters. 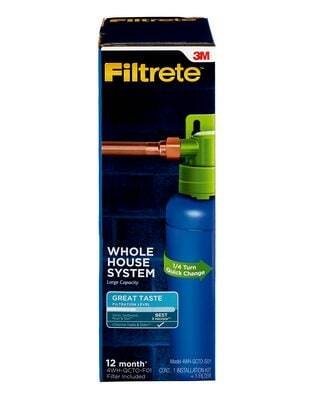 Filtrete™ Standard Whole House Quick-Change System, Large Capacity is rated 3.5 out of 5 by 8. Rated 1 out of 5 by ScottP from Leaks like crazy Housing leaks profusely. DO NOT PURCHASE. Waste of money and time to plumb and install only to have it leak. Rated 3 out of 5 by upnorth6 from Easy to change, great taste, poor lifespan. I was really excited to get and install this. My water had a bad taste and this took care of that. I wasn't getting a lot of sediment or heavy staining or anything like that, but these still only last about 4-5 months at my house. The cost has thinking about installing a different system less than a year in. Rated 1 out of 5 by BMoreAndrew from Destroyed my water pressure Bought this a few months ago, was sluggish about getting it installed, but when I finally did, it completely ruined my water pressure. So I wasted the money on the filter, wasted the money on getting a guy to install it, and will now waste the money on having it taken out and replaced with normal piping and terrible water again. Can't run a single faucet for more than 30 seconds at a time. Thanks Filtrete. Rated 5 out of 5 by DennKel from Excellent Filter I am so happy that I used this filter. I switched to this filter after using another brand for a long time. Rated 4 out of 5 by aesweeps from Quick to change These are awesome and super easy to change and very quick. Wish everything was this simple.